Brent Cizek was out on a Minnesota lake scouting for a good location to take some wildlife photos when he noticed an incredible act of parenting. 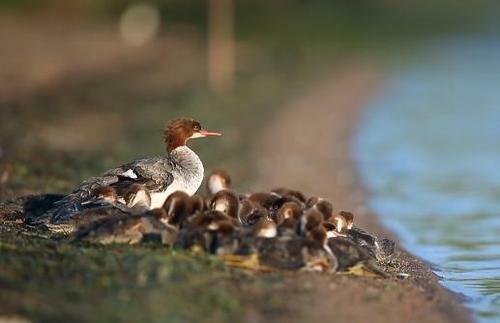 The display of maternal instinct did not come from a human, but from a duck. As Brent was checking out his surroundings, he noticed a mama duck wading out into the water with about 50 adorable ducklings swimming along behind her. At first, Brent did not want to disturb the sweet scene. However, because he wanted to be able to capture the moment on camera, he found the brood later and snapped these sweet pictures. Brent was so awestruck by this scene that he continued to return to Lake Bemidji multiple times to take more pictures. It seemed like every time he returned, the mama duck had picked up more ducklings to add to her growing family. At one point, Brent documented that the duck had at least 76 babies with her. 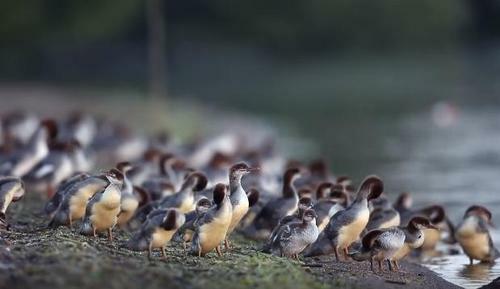 The National Audubon Society said that the merganser duck pictured probably picked up lost ducklings who had been separated from their mothers. Because adult ducks do not distinguish their ducklings from others, they will immediately become a mother figure to those in need. 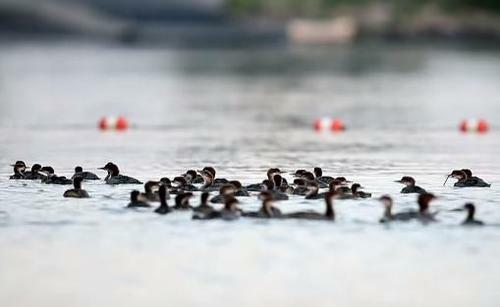 Brent also noticed that the mama took the time to check on each of the 76 ducklings individually.